Last May, I spent a weekend in Cirencester with 200 people that I had never met before. I know it seems odd! The Friday evening buffet was a fancy dress affair. I don’t mean black tie long dress – I mean fancy dress! 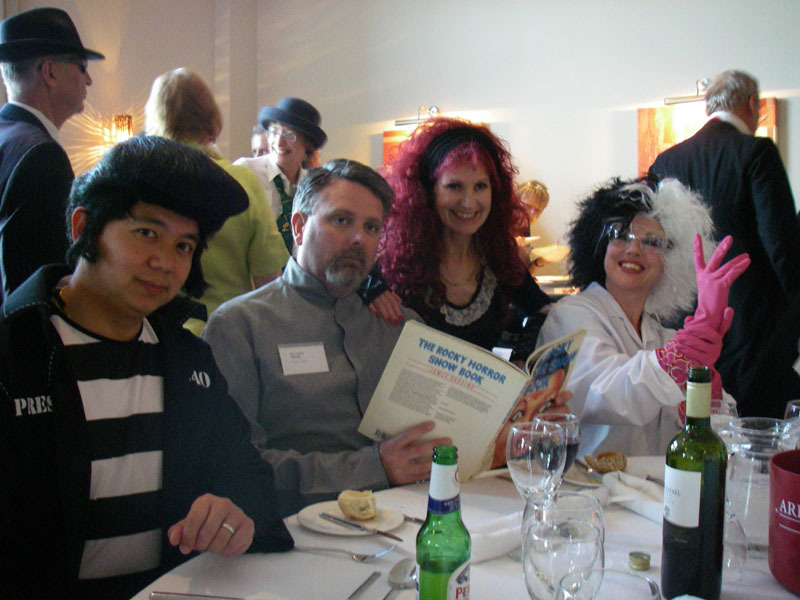 The theme was musicals – I went as ‘Laura’ from Dreamboats and Petticoats. No one had heard of it so sadly I did not win the competition. However many people did comment on the school girl outfit the following day. So I did not go unnoticed after all. There was a black tie, posh frock do the following night after the International speakers competition. This was the Toastmasters International annual conference and the penultimate round in the International Speaker’s competition. The winner was to go to America for the finale. I wasn’t speaking – just as well as, I was that nervous I couldn’t stop my legs from shaking. However, I had a great time meeting lots of new potential friends, all with a similar ethos in life. I listened to and met some really tremendous presenters. I got some great tips, heard some well positioned evaluations and made my own that coincided closely with the judges. There was camaraderie, mutual complimentary back slapping (nothing new in this life) and a great deal positive support. What I really want to share is that there were so many professional speakers there – giving each other tips! To start with I thought this was a little weird. Toastmasters International is supposed to be about encouraging people who don’t speak – to speak. So why were all these professional speakers entering the competitions (and winning them)? Then, I remembered; I was a professional trainer and a qualified teacher … So why was I there? Toastmasters is a network of like-minded individuals that meets to help develop others in their vocal delivery and leadership skills. It is a perfect place for trainers and professional presenters to build relationships and to share best practice with others. Of course, we all know that if we wish to hone our performance we need to surround ourselves with those who will challenge, stimulate and inspire us to reach the next level. Toastmasters is a powerful a network. It has a format and a proven formula for personal development. There is support from neighbouring clubs, the area, the division and the district. Plus there are short and long term personal and club goals. These give sufficient enough purpose to keep professionals involved in the club. In the past year I believe I have improved my presentational performance and my critical evaluations enormously.